Sometimes when candy wrappers tell me I could be a winner, I believe them. Of course, I believe other things, too. I believe soda caps, kiosks at malls, raffles for giveaways at local stores as well. 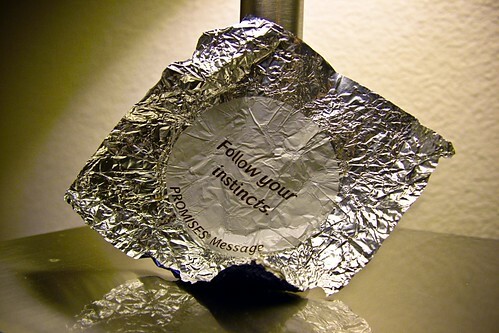 It’s just that I seem to interact with candy wrappers most often. Come on – you do it too. You may not do it all the time, but you’ve sat there with nothing to do one time and asked your friend to type it in, or you’ve wandered online just to see what it’s about. Right? RIGHT? Did you maybe read this post because you thought the title would bring you the slight promise of reward? Because I have to admit that sometimes I sit around and wonder what it would be like to be the person who came home one day, opened up a bottle of soda and freaked the hell out because she just won $100,000. Or if I seriously got to be whisked off for a vacation someday. Or what about a new car that I only have to pay the taxes and associated fees on? That last one would be kind of a bummer at first and difficult to manage on such short notice, but still TOTALLY AWESOME. I’m not as terrible as I used to be. Companies putting a code on their products that force you to go to their websites to enter a code was a clever move. At first it made me really upset because I’m not going to go through all that nonsense. My suspension of disbelief lasts about 3 seconds. Unless I can lift up a flap, twist a cap, or look in a box that fast, the feeling that perhaps I have the golden ticket is far gone. But over time I grew to appreciate it because now I have a reason not to want to pursue the ridiculous notion that I could be in Hawaii next week because of a Butterfinger. I’ve entered a few online codes in my day – you know…just to see – but clicking a mouse can’t replace that feeling of true hope I sometimes had right before I peeled open a candy wrapper to find out I was actually just a big fat loser. It said try again but it didn’t really mean it. It knew I wouldn’t ever win. Maybe it will hit me when I don’t suspect it. Maybe something totally awesome and random is going to happen to me and it will be when I’m not peeking under wrappers and labels and lids. Or maybe hoping something will happen when I don’t suspect it is just as bad hoping for something in the first place. I think I need to give it up. The golden ticket isn’t coming around any time soon – just a bunch of advertising and little “you lose” messages to make me feel badly about myself. Photo by "owlpacino". Click to check out their Flickr PhotoStream. Today’s RAK: Working alongside a friend til their job is done and asking nothing in return. Holy cow! That’s what I want. Yes. HOW DID YOU DO IT. I must know your secrets. Now. I wish I had secrets! It was pure cosmic luck. The contest was lottery style, every time you opened a credit card you got an entry. It was completely surreal when they came to announce I won for the NW region. I thought for sure it was a joke. I just hope it didn’t use up all my winner karma at 21. I hope you did. No offense, but if karma is still hovering around you after all this time, it will NEVER make its way over to me. I won, once. At my little brother’s insistence I entered a GamePro contest back in Ought two. I ended up as the grand prize winner – PS2, XBOX, GameCube, and a slew of games. I sometimes wonder if I didn’t just blow a lifetime’s supply of luck on video games, thus screwing myself out of ever winning the lottery. That sounds amazing! An entire bundle of gaming ecstasy was delivered to your front door. Who care about the lottery when you can bury your face in a game all your life? It worked for Charlie Bucket; it might work for you. Don’t give up the dream! I’d like to point out that all the other children involved died or were severely blueberried. I don’t like those odds. Blue is a good color for you. I remember winning some more candy only to find out the coupon had pooping expired. That is the worst, to win at an inopportune moment. They should be forever negotiable. Anything else is teasing. Real winners make it happen. Ain’t that right Jackie?? How’s the new fitness palooza working out? I’m not gonna lie – it’s hard some days to not be a fatty fat and eat whatever I want. But patience and perseverance seem to be doing the trick in the long run. Well thanks for the compliment. 🙂 Just set your email alerts to send you an email when you get a subscription or like. If you check your email one day and it’s busting open with wordpress emails, you’re probably Freshly Pressed. And until then, you don’t need to worry about checking the home page. I don’t bother going online with codes to enter because I just can’t be bothered and I’ve stopped believing I’ll win. But I do email comps. And I haven’t won. Don’t know why I still believe in those. Apparently other people win – according to some of these comments. Maybe we should try reveal their hookup. I do the same thing but usually with the fortune cookie. Who could resist quotes like, ” you will be successful” or ” you will have a lifetime of happiness.” congrats. I tend to get strange fortune cookies. Like a few days ago I got “keep walking so you don’t walk through mud” – which left something to be desired. That’s the only time where I won something. Of course I’ve tried since to win to the lottery but nope, I guess I’m not THAT lucky ! That’s awesome 🙂 – Well what did you do with the jacket? Did it actually fit you or is it like one of those ‘here’s a free t-shirt that’s 3 sizes too big’ things? Very cool – I love that you still have it! whoa that’s a little sassy for a dove wrapper. I expect things like “love yourself.” and “eat more chocolate”. I love it when I get one about eating more chocolate. Thank you so much, Elizabeth 🙂 I appreciate you stopping by! Have a lovely weekend as well.